The hidden riches of India lie in its breathtaking beauty and its diversity of cultures. With world’s leading luxury train, Maharajas’ Express, you can embark on an unforgettable escapade that starts off with the capital city of Delhi. Guests journey their way through iridescent lands of Jaipur to reach the vivid greens of Ranthambore. with the ancient capital city of Mughals, Fatehpur Sikri and then to Agra where they can witness the immortal sheen of the Taj Mahal. 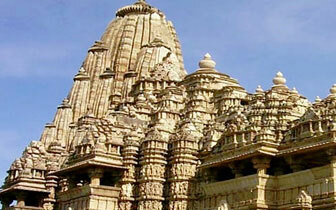 Soak in the regality of Gwalior and discover the sensuous moods of the temples of Khajuraho. Not to forget the sacred city of Varanasi and the divine beauty of River Ganges and lastly, the elegance and imperial splendor of Lucknow. Any expenses caused by reasons beyond control of Apollo Voyages or it associate office in Varanasi. Guests get to enjoy a traditional welcome and greet the luxury in a grand style at Delhi Safdarjung Railway Station. Treat your appetite with a lavish dinner on-board. Guests spend their night on the Maharajas' Express that leaves for the first destination in its Indian Luxury odyssey, Jaipur. Wake up to a delicious on-board Breakfast as you arrive at the Pink City, Jaipur. To take a closer look at the history of Jaipur, guests visit the ancient Amber Fort which is known for its artistic Hindu style elements. Maharajas' Express is a leader in cultural tourism and we ensure that our guests don't miss the cultural essence of our country. After visiting Amber fort guests proceed to City Palace/Jai Mahal Palace for exclusive Elephant activities where guests may choose to decorate them with bright hues, feed them or take the regal ride. This is followed by lunch. Afterwards guests return to the palatial comforts of Maharajas' Express or may also choose to participate in the optional activities that we provide in our Indian culture tours. Guests can choose from Spa facilities at the 5 star hotel Private shopping tour visit to City Palace Museum and the Observatory, the world's largest stone sun-dial that is colloquially known as Jantar Mantar Guests can treat themselves to an on-board Dinner. The Maharajas' Express then leaves for the second place in its Indian luxury odyssey, Sawai Madhopur to bring you closer to the flora and fauna of India. The world's leading luxury train arrives at Sawai Madhopur and guests proceed for an exciting Game Drive at Ranthambore National Park. 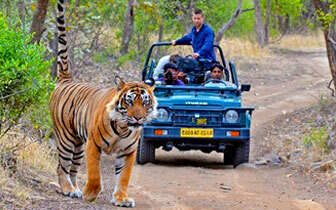 The shimmering greens of Ranthambore are included in all our pan-Indian itineraries. Guests can then return to the stately comforts of Maharajas' Express. After an on board breakfast the Maharajas' express departs for the ancient Mughal capital, Fatehpur Sikri. Guests can have lunch on Board as they arrive in Fatehpur Sikri. Guests can closely explore the deserted city, Fatehpur Sikri where once the Mughal emperor, Akbar ruled. Guests later return to the comforts of the Maharajas' Express for an on-board Dinner. 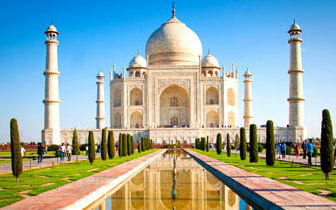 The train leaves for another alluring city in Maharjas' Indian culture tours, Agra. Guests Arrive in Agra and continue their Indian luxury odyssey with visit to the monumental symbol of love, the Taj Mahal. Guests can enjoy a princely Champagne Breakfast atop Taj Khema and later return to the comforts of Maharajas' Express. 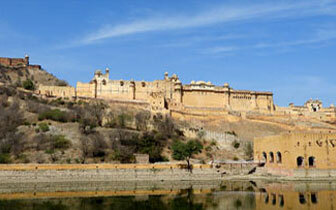 Maharajas' Express then proceeds for Gwalior, a new destination in our mesmerizing Indian culture tours. Guests can enjoy an on-board lunch and then proceed to visit to Gwalior Fort, Saas Bahu Temple and Jain Cave Sculptures or they can also choose to avail spa facilities at Usha Kiran Palace Hotel . Over the years we have created a niche for ourselves in Indian culture tourism and afterwards our guests can visit the Jai Vilas Palace Museum followed by Hi Tea in the compound of the palace. Guests later return to the palatial comforts of Maharajas' Express. Guests spend their night on board amidst comfort and luxury as the train is stationed overnight at Gwalior. Early morning the train leaves for Khajuraho to visit the magnificent temples of Madhya Pradesh. Enjoy delicious on-board breakfast and lunch at our thematic restaurants- Rang Mahal and Mayur Mahal. Arrive in Khajuraho and proceed to visit the Khajuraho temples (Western Group Of Temples), the beginning of spiritual escapade in our Indian luxury odyssey. Spa facilities at a 5 star hotel Sound and Light Show Dances of India Show Guests can either return to the comforts of Maharajas' Express or may choose from optional activities Our unique itineraries have helped us to become the leader of Indian culture tourism. After an on-board dinner, Maharajas' Express continues its spiritual escapade. Guests spend their night on board at Maharajas' Express that proceeds for Varanasi, one of oldest continuously inhabited city. Guests please their taste buds with an on-board breakfast. 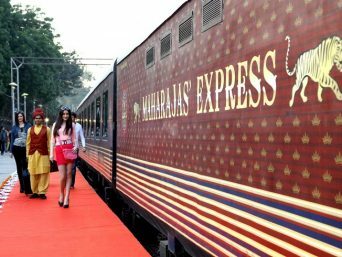 Maharajas' Express arrives in Varanasi and gives its guests the authentic taste of Indian culture tourism. 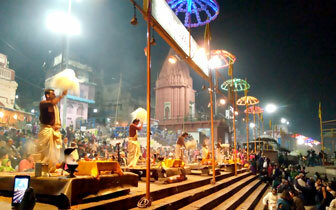 In Varanasi guests visit the Silk Weaving Center followed by a sumptuous lunch at Taj Gateway Hotel. Afterwards guests visit Sarnath ruins and museum. Even in our Indian luxury odysseys we ensure that our guests do get to observe the divine side Indian culture, our guests enjoy a boat ride at the holy river Ganges to witness evening prayer. Guests then return to the comforts of the Maharajas' Express and have dinner on-board. 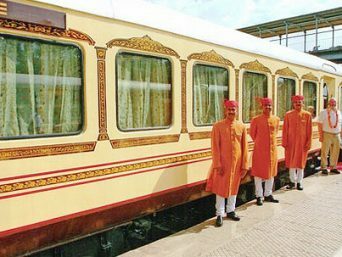 The Maharajas' Express leaves for the city of royal splendor and relishing delicacies, Lucknow.Guests spend their night comfortable on the opulent Maharajas' Express. Guests start their day with an on-board breakfast. 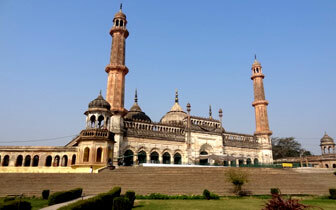 Guests proceed to visit Bara Imambara, Chota Imambara, Rumi Darwaza and The Residency followed by delicious Awadhi lunch along with the live Kathak Dance performance at Vivanta by taj. Taj. We believe catering everything with extravagance in our Indian luxury odyssey. Guests later return to the comforts of Maharajas' Express and enjoy an "Indian Evening" followed by dinner on-board. Then Maharajas' Express leaves for Delhi, marking the end of it's Indian culture tour. Guests begin their day with an on-board breakfast. 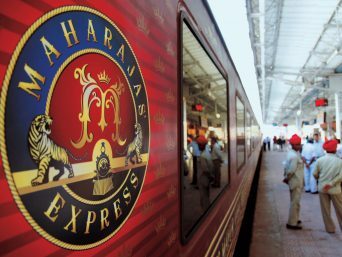 Collect your unforgettable memories and bid farewell to the Maharajas' Express as your journey comes to an end!